It took three and a half day and night to sail from Grenada to Bonaire. We had practically no wind the first day which was unexpected but we were still under sail though. The wind picked up and for two days we had great sailing at 20 kn. The last night however it really started to get windy with large waves. We had 35 kn as the most. We «surfed» around the Southern tip of the island early in the morning, just before daylight, and Peach arrived in Kralendijk soon after. It was still easy sailing with the help of the lights from the island and good wind angle. We moved pretty fast though. 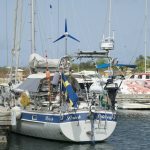 Unfortunately all mooring buoys were occupied in Bonaire and had been so for the last five weeks we were told by the Harbor Master. According to the Marina Office we could not expect to get a buoy why we had to berth in one of the two marinas. We decided to dock in Harbour Village Marina when the wind was still strong and the marina was fairly sheltered. We would have loved to anchor but that is forbidden around the island which we knew about but annoying of course. All sailors on-route to Bonaire should be aware of the difficulties to get a buoy and take note of that a buoy cannot be reserved, “first come first serve” according to the Harbor Villages Marinas rules and regulations. We hitchhiked to and from the city center several times due to some problems with the local sim-card which did not work properly. The walk to the city center was approx. 30 minutes. Those who stopped and took us on board were very kind and gave us lot of information on practical issues. We have also had nice talks with people around here and everybody has been very helpful. The evenings in the marina offered a lot of mosquitos why we had to cover all openings very carefully to avoid getting bitten during our sleep. At the same time, good preparation for coming mosquito areas in other places. 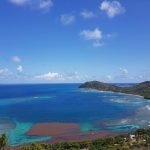 The island has a strong environmental legislation and we assume the prohibition to anchor is for the protection of the coral reefs. Bonaire is known for excellent diving and snorkeling. Be aware of that diving as well as snorkeling requires a special permit which can be obtained in a dive shop. It is not permitted to dive on your own, only in company with a guide. The town, we was told, has been really developed the last five years and is now a very charming place especially along the waterfront. 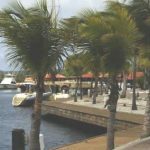 It is easy to understand the large number of cruising ships visiting Bonaire which also goes for those who decide to stop here and make a living. keep the freezer on, 18 liter only, for some more time. It seems that we have enough electricity via the solar panels and the wind turbine. Ice cubes are otherwise a luxury here! 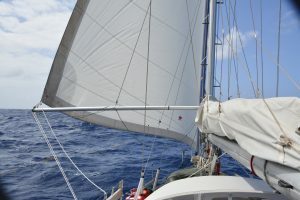 We think that next stop might be Curacao, 42 nm from Bonaire, and if so, we plan to anchor in Spanish Bay if possible. But no decision taken so far. 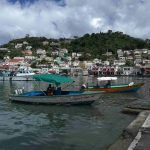 After maintenance, repair and just a wish to see Trinidad we are back in Grenada. Focus was whether Sweden will advance in the WC soccer game. Well, they reached the quarter final but lost to England. The Swedish team was not to be recognized and England did a better job. 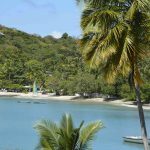 The trip to Grenada was easy even if the risk for piracy was there. No such thing happened and we arrived safely to the anchor place in Martins Bay just outside ST Georges. Anchoring may be somewhat difficult in the Bay due to a rocky ground. Although, to get good holding is possible but remember to use a long chain, at least 5 x the depth. Look out for heavy rolling at some places in the Bay. We have learned that things break and this time it was the charge controller to our wind turbine, Aerogen-4. The controller could not handle a period of very strong winds during one of the nights at the anchor berth. We had 42 kn for a short while together with heavy rain. A number of yachts went drifting as well and we were happy not to be in their way. 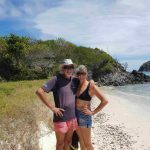 The day after we were involved in a rescue operation when a French Cat went drifting and would have disappeared into the Caribbean Sea if not a sailing friend from New Zealand and Peach had acted. Next evening we were offered a lovely gathering at the Cat with French snacks and good wine. Back to the turbine, when the device is no longer manufactured and the charge controller cannot be found anywhere, we had to invest in a new one. The choice was an Air-X, Silent version. A lot of work installing the device. By the way, we also received a new electrical motor from Echo Marine for our water-maker which still did not work properly. The system has been up and running for a couple of hours and finally everything seems to be ok. We produce 65 L/hour which is good. After a small hurricane, Beryl, has passed us, well far north of us, we will cast off for the ABC Islands, finally. Actually, Beryl has been reduced to a tropical storm as we speak. 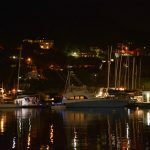 While the hurricane was moving towards the Islands we took a berth at Grenada Yacht Club which is a place we recommend. Now we are doing route planning and preparations. Time to move on with our story. 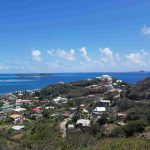 After our arrival to Grenada in late January, months have passed and June has arrived. We awaited our daughter Jessica’s arrival moored in Prickly Bay while at the same time took care of some maintenance work necessary after our Atlantic crossing. Immediate after our arrival we first needed to check into the country which was fairly simple when both immigration and customs has an office there. What took a surprisingly long time was all the extra such as getting local currency, find a god supermarket and collect information about a million other, important, matters we wished to know about. All this took a couple of days. And of course we were pleased to look back at sixteen lovely days and nights at the Atlantic Ocean where everything worked out the way it should. We really enjoyed the journey. Prickly Bay is a place many have told us about. It’s fairly sheltered, there is a chandlery, a restaurant and a lot of yachts and is of course a safe place to be. However, it was very crowded when we arrived which is not our cup of tea really. The water quality was not that good either and the visibility was only between 1-2 meters. We were reluctant to use our water maker which again worked after we had received spare parts from EchoTech in Trinidad. The most positive part in Prickly Bay was all the nice and experienced sailors from various parts of the world, Sweden included, we joined with. It was comfortable to just relax for some days even if it rained every day. Actually it rained almost every day for a month, that is, the whole of February. Everyone we talked to said that this was very unusual for that time of the year. On top of the rain there were also strong winds which prevented us from leisure sailing in the neighborhood. In late February the weather was somewhat better and we took of for islands further north with Jessica at the helm. say that sailing between the islands, between different countries, requires a lot of check-outs and check-ins. At anchor in Chatham Bay we went uphill one day and got some nice pictures vith a great view. 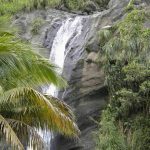 Back in Grenada we hired a taxi for a tour to one of the many waterfalls on Grenada where a nice surprised was the ride up the mountain through the jungle. A lot of birds and many unknown plants. On our way down the mountain, I picked, or rather Jessica did with the support from the taxi driver, a cacao fruit ready for chocolate making. My plan was to make a small chocolate bar but unfortunately I waited to long and the fruit become bad. A pity when I had downloaded all I needed to know from the net. After the nice stay with Jessica it was time for us to get back to Sweden. Karin for work and for me support, and other business… being retired from work. 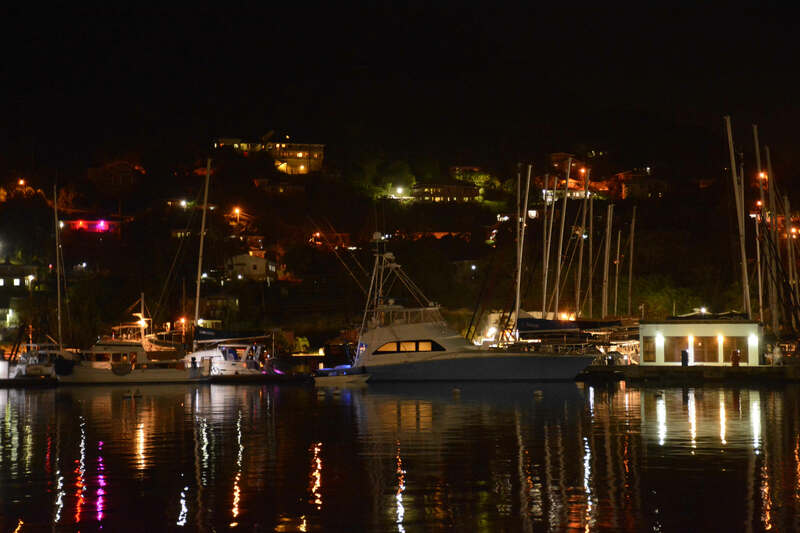 Peach was safely moored at the Grenada Yacht Club while being away. We have no problems with recommending the Yacht Club to others. Good security, nice staff and decent prices. 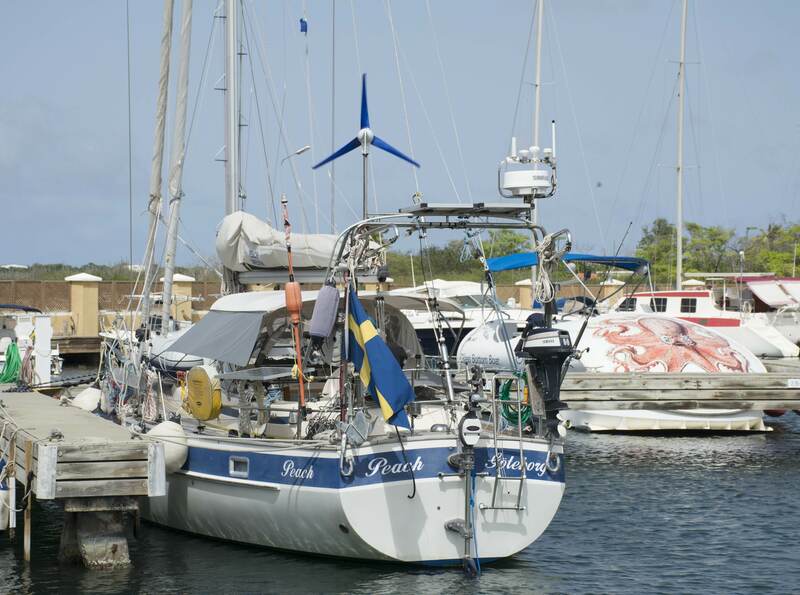 When we got back to Grenada from Sweden we started to prepare for the journey to Trinidad where we had planned to get a new forestay and visit EchoTech to buy some spare parts. The planning involved to inform the coast guard in a float plan describing our ETD, ETA and course. The reason for this was to let the coast guard know our position if we are unlucky to encounter criminals or thieves. We arrived to Trinidad after approx. 17 hours of sailing and no criminals in sight which was a relief of course. All sailors are not that lucky. Terrible that such precautions must be taken. Currently we are moored at Powerboat Marina and have got our new forestay in place by Jonas and his company Trinidad Rigging. For all of you who wish a rigging expert we strongly recommend Jonas to help you out with any rigging problems you might have. We have also left our sails in the hands of Superb Sails located at Powerboat marina for maintenance. They have a good reputation although we are still waiting for our sails to be returned but are having no doubts that their work will be anything but good. We also had Peach hauled out for a day to replace an inlet manifold to a bigger one and to clean the hull. 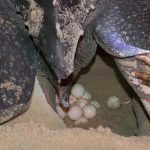 Before we leave Trinidad we have planned for a “turtle egg-laying” tour which we are looking forward to. Trinidad is known for having the largest population of returning turtles. To the right you see a photo from the egg-laying in progress. Our turtle can deposit 100-120 eggs of which abut 80 eggs are fertilized and about 30 eggs unfertilized. If you click on the picture to the right you access a short movie taken of the egg-laying process . We have also met a bunch of really nice sailing friends and have learned about different kind of activities e.g. from the net, VHF channel 68, at 08.0Turtle-viewing_Trinidad_20180 every morning, superb service. Our next step is to take off for the ABC Islands with a detour via Grenada to minimize the risk for a criminal boarding party along the Venezuelan coast. We cross our fingers and we’ll let you know how it goes. And by the way, the Swedish Midsummer on 22 June (Midsommarafton) will take place on Friday next week. We might be under sail and that’s ok. Christmas was also under sail. Besides, we have neither herring nor snaps, the very important Midsummer attributes, so we might as well be at sea. We wish you all a lovely Midsummer with nice weather, good food and drinks and a lot of fun…with singing the Swedish song ”små grodorna”, why not?! 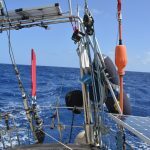 After leaving Cape Verde we went south to avoid a strong westerly wind normally increased by the Islands. Those of you who have read about our rudder problem prior to Cape Verde fully understand our wish for lighter winds. After 48 hour we turned west which was a good decision. The wind came from northeast with a speed of 22-25 kn for days. On the fifth day the wind decreased to about 16-19 kn why we had to set the whisker pole for the first time since leaving Puerto de Mogan. The set-up lead to nice sailing where we do not need to worry about our foresail. Surprisingly several fishing boats turned up around us and because of their rather high speed we believe they were out catching big fish like Tuna and Blue Marlin perhaps? The weather forecast downloaded from our SSB promise nice sailing conditions for at least 2-3 days. Were better than expected. We had hoped for a perfect wind and actually got that. 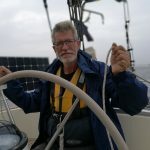 The wind speed stayed between 18-26 kn the whole journey which in total, from Cape Verde, took 16 days despite our southwesterly course the first two days. Pretty good! The wind was enough for the use of the genoa only with the help of the whisker pole. Only minor problems during the way, a toilette hose got jammed which only took 5 hours to fix and a reduction valve for a gas bottle had to be replaced. And, actually on our way to Cape Verde the boost pump to our watermaker died why we did not have any possibility to produce water on our way over. We had enough water but needed to be cautious of course. Well on Grenada fixing the watermaker is highest priority. During our time out there we talked about the mental stress being alone in the middle of nowhere, and yes, there is such a stress. Not because there is a reason to be afraid but the uncertainty whether something bad will happen is there. A really bad change in the weather is very unlikely this time of the year and we trust Peach completely, still, well you know, one is lonely out there. Anyway and finally, Grenada is emerging from the sea ahead of us and our first Atlantic crossing is a fact. Will be nice to moor in Prickly Bay for a couple of days. 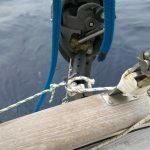 Below a copy of an article in Swedish to sailing organizations in Sweden regarding rudder failure on Peach in the Atlantic on the 22th of December 2017. 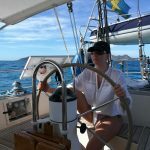 S/Y Peach ligger säkert förtöjd i Mindelas Marina, Sao Vincent, Kap Verde efter roderhaveri. Olyckan inträffade ca 300 nm från Cape Verde, kl 01.30 den 22 december. Orsak okänd. Vi fick lägga kurs mot Cape Verde (hade planerat att segla till Västindien direkt från Kanarieöarna), riggade vindrodret som nödroder, använde adekvat segelyta till rodrets kapacitet och seglade i 1,5-2 knops fart, under ngt dygn 2-3 knop, i vindstyrka minst 33 knop i åtta dygn. Under första natten byggde vi ett nödroder av vår mindre spirbom och en träskiva. Det blev en tung sak och med den vind och sjö som var aktuell bedömde vi det som riskfyllt att försöka montera det. 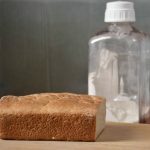 Vi informerade försäkringsbolaget samma dag som händelsen inträffade, dag två skickade vi tre Pan-Pan meddelande för att varsko fartyg i närheten om vår belägenhet men vi fick ingen respons. Seglade därefter med tänd däcksbelysning och ankarbelysning under nätterna för att visa att vi inte hade manöverförmåga, hissade också signalflagga D. Vi skickade begäran om hjälp till JRCC och i vår värld avsåg det hjälp i form av bogsering. Vi hade fått info i mail om att bogsering skulle kunna vara möjlig om vi kom närmare Cape Verde. Vi skickade inte mayday eller utlöste vår Epirb då vi själva inte bedömt oss vara i absolut nödläge vid något tillfälle. Vi fick erbjudande dag 2 om att bli hämtade av fartyg men tackade nej då vi bedömde att det trots allt gick att segla båten och vi inte ville lämna Peach och vår segeldröm. Vi avvaktade sedan information om bogsering under hela haveriseglatsen men det visade sig i slutänden att det inte fanns någon som hade möjlighet att genomföra uppgiften varför vi själva seglade hela vägen in i hamnen och till bryggplats utan hjälp. På båten har vi agerat utifrån att vi själva måste klara av uppgiften och navigerat, seglat, vaktat, kommunicerat, planerat för mat, ätit, sophanterat och sovit precis som vid ordinär översegling. Vi tog oss också tid till att packa för och gå igenom rutinerna för att lämna båten för att klättra ombord på annat fartyg eller lämna via livflotten. I övrigt läste vi en del, kollade sjökorten för Västindien, pysslade, plockade flygfisk från däcket, räddade en trött fågel, tittade på guldmakrill, pratade med delfiner och vi firade julafton med skinka, sill och köttbullar men avstod Janssons frestelse eftersom det trots allt var ganska gungigt. Peach har visat sig vara segeldrottning och vi är mycket tacksamma för hennes fantastiska sätt att klara av att parera den kraftiga och varierande sjön, i den utsträckning det varit möjligt. SSB radion har varit till stor nytta men vi kommer att komplettera med satellittelefon, hur det än är så vill vi kunna kommunicera omedelbart vid planering/samordning av åtgärder och inte avvakta att möjligheten ges ett halvt dygn senare först när konditionerna tillåter. Dessutom har det visat sig att kommunikation med ovana SSB radioanvändare är en utmaning. Ett stort tack till Gunnar Bulukin som med värdefullt engagemang arbetade för att få till stånd bogsering och hamnplats, samordnade/vidarebefordrade information, och som vid ett tillfälle hjälpte till att ta bort mail i Winlink, mail som var för tunga för att kunna hämtas och som helt enkelt låste oss ute från kommunikation. Tack också till vårt försäkringsbolag Pantaenius för bra samarbete som nu fortsätter i fråga om reparation av rodret. Tack till JRCC/MRCC och fartygen Stemnitsa, CTS Unity och Giovanni DP. Slutligen tack till skeppare och crew på T/S Gunilla som höll kontakt med oss när vi närmade oss hamn och som mötte upp med jolle ifall vi hade behövt hjälp med ankring. Vi planerar nu för kontakt med varv och reparation av rodret och hoppas att vi så snart som möjligt kan fortsätta vår seglats till Västindien.